When news broke in April of an alleged plot to unseat and possibly harm President Thabo Mbeki, the South African leader suddenly found himself in the midst of an intense debate about his ability and future. For South Africans, the crisis had a familiar air. In the past, political jockeying within the African National Congress (ANC) has led to allegations of conspiracies to oust both Mbeki and Nelson Mandela—but the allegations have always evaporated under scrutiny. This time, a serious inquiry was guaranteed, since the charges were made by the country’s top law-enforcement officer, Minister for Safety and Security Steve Tshwete. On April 24, Tshwete went on national television channel SABC TV and named Tokyo Sexwale, Mathews Phosa, and Cyril Ramaphosa as the orchestrators of a plot against Mbeki. The three high-ranking ANC members are all former politicians who have become respected businessmen in South Africa. The media erupted in fury when it emerged that Tshwete’s information came from ANC youth leader James Nkambule, a dubious character who has been charged with defrauding the government. Nkambule claimed to have discovered a plot that would discredit Mbeki by linking him to the death of former Communist Party leader Chris Hani, a national idol. Media commentators saw Nkambule’s claim as an attempt to shore up Mbeki’s support in the ANC by smearing future rivals in the party. Tempers flared further on May 6, when a group of prominent black professionals took out a full-page advertisement in Johannesburg’s conservative Sunday Times that alleged a racist, anti-Mbeki bias in the South African media. “The media...seem to provide a platform for a coalition of right-wing forces made up of white so-called liberal politicians,” read the advertisement. The press was quick to retaliate. Calling the advertisement “a stridently racist attack on the media,” the Mail & Guardian stated in a May 11 editorial that “questioning and challenging are part of democracy.” “The black professionals who placed that full-page advertisement...have taken the easy route of finding others at whose door blame could...be laid,” wrote black columnist Kaizer Nyatsumba in the Cape Argus (May 9). 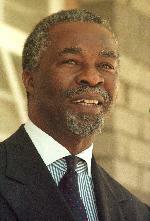 Thanks to his base of supporters in the ANC, Mbeki—who comes up for reelection as the ANC’s leader at the end of 2002—seems to have survived the political fallout for the moment. The same probably cannot be said for Tshwete.